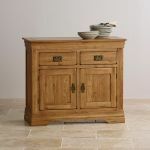 The French Farmhouse Rustic Solid Oak Small Sideboard features a compact yet highly functional design inspired by antique French furniture. Crafted from one hundred percent premium grade solid oak by skilled woodworkers it boasts elegantly flared cornices, inlaid grooves and antiqued drop bar handles. 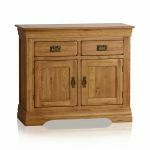 The panelled doors open to reveal ample storage space for crockery and glassware with an oak shelf for maximum storage capacity. 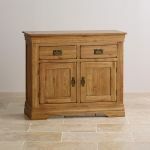 At the top of the unit there are two drawers, ideal for storing any cutlery or linen. 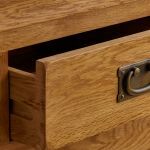 Each drawer has been handcrafted using traditional dovetail joints with solid oak backs, bases and runners for exceptional strength and durability. 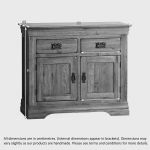 Take a look at the rest of the French Farmhouse range for perfectly matching items which will grace both modern and period homes.